February in Colorado typically brings to an end an extended period when average temperatures are at their lowest. Winter begins to loosen its grip and temperatures get warmer but precipitation is not a particularly common event during the month. Thus far our snow season has been relatively dismal with the seasonal total in Thornton more than 10 inches below average. In the high country, the snowpack is not faring much better. February is only our sixth snowiest month so we may not see much snowfall for the balance of the month. Temperatures however do usually see a nice rebound during the month. Average high temperatures climb from an average of 44 degrees at the start to 50 degrees by the end of February. For the complete February preview including a look at historical averages and extremes as well as a look at what long range forecasts are predicting, click here. 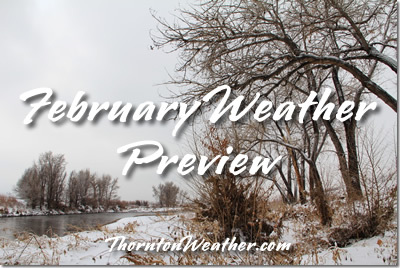 This entry was posted on Tuesday, February 5th, 2019 at 6:13am MDT and is filed under Climatology, Thornton Weather. You can follow any responses to this entry through the RSS 2.0 feed. You can skip to the end and leave a response. Pinging is currently not allowed.